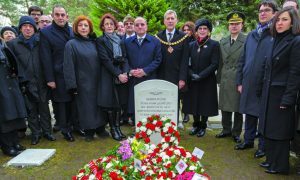 members of the Turkish community in the UK, they gathered around a memorial to those killed fighting against the Allies at Çanakkale, in the Dardanelles, in 1915. Pictured to Cllr Cundy’s left are the Turkish ambassador to the UK, Abdurrahman Bilgiç, and his wife Ezra. Mayor & Mayoress with, to the right of the Mayor, The Turkish Ambassador to the UK, His Excellency Mr Abdurrahman Bilgiç, to his right, the Ambassador’s wife Mrs Ezra Bilgiç.